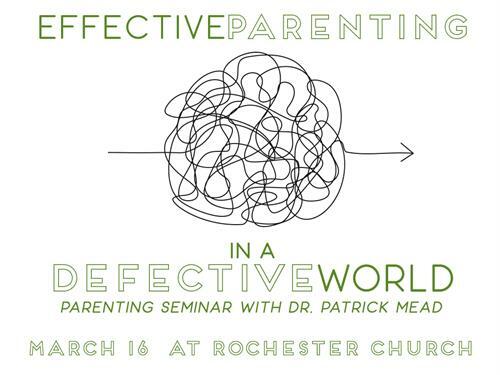 All are welcome to join us on Saturday, March 16 for "Effective Parenting in a Defective World" - a parenting seminar with Dr. Patrick Mead. When: Saturday, March 16, 9 a.m. - 12 p.m.
Join us for a continuation of the seminar duriung our Bible class time on Sunday, March 17 @ 9:30 a.m.
Payment: Cash, checks (made payable to Rochester Church of Christ, earmarked "Parenting Seminar", and credit cards (via SecureGive) are accepted. Once we've received your registration, you will get an email with payment instructions. Please do not submit payment until you receive this email! Saturday, March 16, 9 a.m.-12 p.m.